Affordability: Simply put the jetBook Color will pay for itself instantly, not only through convenience and organization but because of the massive amounts of content already on the unit. 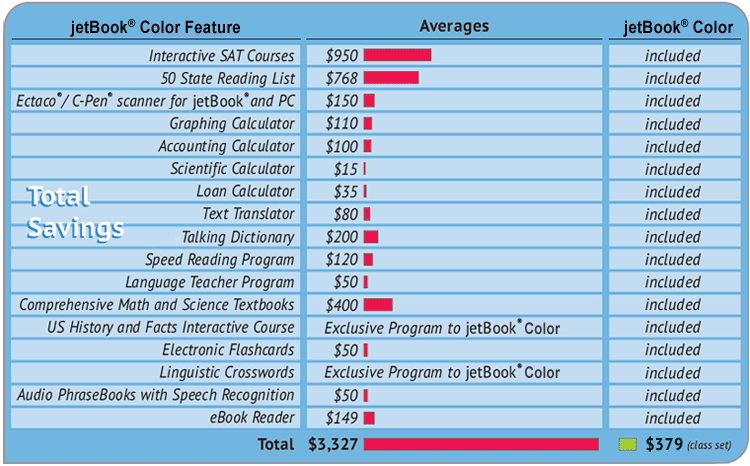 Your average SAT preparation can cost up to $1,000, already more than three times the value of the jetBook! Same with speed reading, and language learning courses. Let's not forget the included graphing calculator which everyone knows can cost anywhere from $80-$120. The time and money you will save by not having to make copies, organize notes and lug around books will more than justify the value. Reliability: The jetBook brand has been available for years now with our oldest model the JB-5 having been released in early 2008. We know our way around eBook readers and were one of the few eReader companies who survived the massive flood of competition. While eReader brands like Cooler, iRex, Plastic Logic: Que, and Astak failed to stay on (or make it to) the market the jetBook name has remained strong. jetBooks can be found almost everywhere from schools to Fortune 500 companies, government institutions as well as homes all across the world. The manufacturer, Ectaco Inc., has been in business since 1990 dealing with language translation and teaching hardware and software. 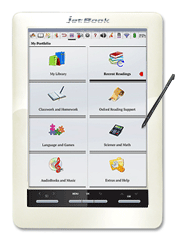 Volumes of Pre-Loaded Content: The jetBook Color is not just an eReader, it is the first Educational eBook System. Over 35 separate programs will assist in almost any course including Math, Reading, Science, Language, History and more. 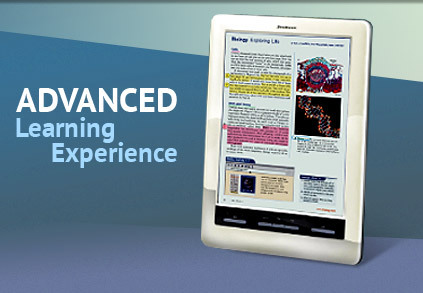 It contains fully interactive SAT courses and additional programs that help improve reading speed. 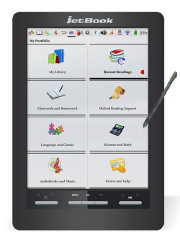 Not only is it a tool to help learn and teach, but it can be used as a language communication device. Speech to Speech Translation and Text Translation features are included and help with ESL students in any classroom. Advanced Technology: The jetBook Color employs the latest in Text-To Speech (TTS), Speech Recognition and Human Voice Pronunciation. This high level of accessibility is great for students at any level. A Triton Color E Ink screen provides clear while eliminating eye fatigue. 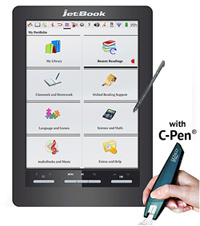 The C-Pen scanner (included) is the latest in Optical Character Recognition (OCR), you can scan and upload text in a book, newspaper or assignment. 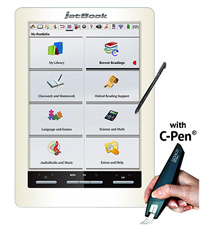 Once it's on your jetBook Color you can store it in your notes or even translate it to another language. Additionally, it has a cradle to stand the unit up and an Ectaco C-Pen scanner so you can scan text, upload it to the device and have it pronounced fluently, translated to any language, or even stored for later use. The Perfect Educational Assistant: Organization and stimulation is key in an environmental setting. Too much or too little can create a less-than-optimal learning situation. 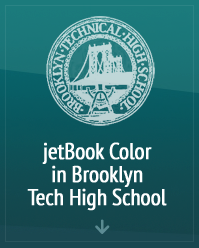 The jetBook Color will provide just enough stimulation to make a student interested in what they're learning and enough resources to organize and refer to information on-the-go. It's light enough and small enough to fit in your pocket and provides an optimal reading surface. The device blocks access to online browsing and will not allow games and other distracting applications to be downloaded so the student can remain focused on their work.